This one owner, clean Carfax, west coast owned new body style 340 M-Sport is the ONE if your in the market for an under warranty, new body style, inline 6 turbo BMW! Normally we would start by talking about how amazing white is and that this 340 has the 2019 M wheels that are amazing or how with 20k miles this car is not even broken in yet BUT this rare low mileage 340 has the MUST have huge M Performance Brake Package that give it that true enthusiast look! The over sized blue M Performance brakes stand out especially with the M logo's AND dont forget they stop on a dime! Dont buy your dream car without heated seats, Backup Camera, the Harmon Kardon Stereo Package or the Technology/Navigation Package.. This 340 has all those and more! Don't save a grand or two up front on one that is missing a few must have options, the rare one's with all the must have option's ARE ALWAYS worth more, so you will get your money back when you trade it in or get your next car AND you get to enjoy those options the whole time you own it! Just like white on black. Its the most coveted and will ALWAYS be worth way more than any other color combination! The white just shows off the body lines way more, doesnt show blemishes, and will never have swirl marks like all of the darker colors. The 2019 M wheel package is EVERYTHING! Not only do they look stunning but the make this 340i look like a one year old car rather than the other M wheels that came on the 2012 M's! Dont spend top dollar and look like one that someone else can buy for 20 grand! The newer headlights on the 340's are next level and also will have you looking new age for the next 7-10 years! The flat bottom HID halo's are something else! The person who buys this will most likely have the best headlights on their block! This is a west coast owned, one owner so there is no rust/corrosion issues! Dealers can buy cars from Illinois, New York, East Coast, Midwest Michigan, Canada ect with rust for $2500-$5000 less than the same car but from the west coast. Not only is this a west coast car its a 1 owner with no blemishes at all on the Carfax. No accidents or damage reported, minor damages, rental car, or odometer roll backs. 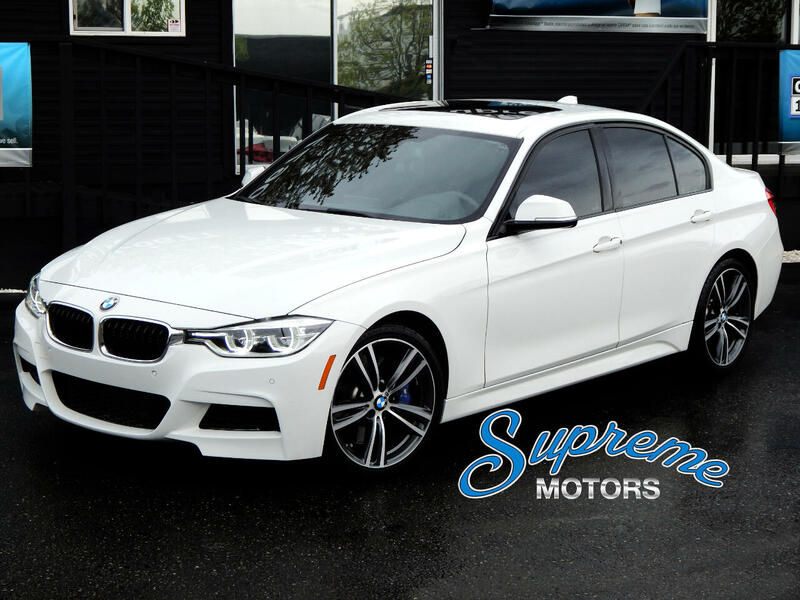 At Supreme Motors, we ONLY sell the best of the best and this 340i M-Sport is another prime example of our meticulously inspected, coveted color combination, clean Carfax, and rare optioned inventory that we select for our new clients. The must have M-Sport Package. If you dont know much about the M-Sport get ready to learn about why its EVERYTHING on any BMW. The M-Sports are way more expensive compared to the regular base or base sport BMW's and will ALWAYS be worth way more than the dime a dozen regular models because of all the upgrades you get and the rarity. The exterior gets a fully redesigned front and rear bumpers that totally change the whole look of the car. Add in the top optioned M Wheels and you get one of the most desirable exteriors in the game especially the newer age M wheels. The mixture of sport and luxury is amplified to the max with the M-Sport Package. The interior on the M-Sports give you the nicer seats and M steering wheel. GAME CHANGERS! Its only what you sit in, and hold on too the whole time your in your investment. The higher quality leather is the first thing you notice, and at closer inspection you will realize how much nicer they are, or just sit in the base model right after you sit in an M-Sport with the seat package. You wont want to get out of the M-Sport. All of the M logo's on the wheels, steering wheel, and door plates let everyone know this 3 series is special. This 335i has it all and its in absolute IMMACULATE inside and out! M-Sport Package, M Brake Package, M-Sport Wheel Package, Technology Package, Backup Camera, Harmon Kardon Premium Stereo Package, Heated Seats, Sunroof, Bluetooth, USB, power everything and so much more! Dont settle for missed option's, blemishes on the Carfax or a car that hasn't been meticulously maintained. Its only one of the largest investments you make, and it will always be worth way more than a car with blemishes on the Carfax such as accident's or cars that are missing option's. Remember one of the most important factors on any purchase is that it is not an east coast car, Florida, Texas, Canadian, Michigan, Illinois. We dont sell ANY rust buckets AKA most non west coast cars, or cars that the undersides have been painted or had under coating applied to hide corrosion. This assures no rust or corrosion or the chances it was involved in a flood or hurricane. We had to pay over $4000 more for this 340 M-Sport because it had a clean history, its white on black, all the options, M-Sport Pkg and the M Brake package! We could have bought a 2016 340i in silver with the tan interior, or an accident on the Carfax, from New York (or any rust area), without M-Sport package, with the exact same miles and WE could have it priced at $25900, but that does not mean it is a better "DEAL". Its just a lower price for a lot less quality. Its a lower price, NOT THE BEST OVERALL DEAL. Its an investment and what you are going to own and drive around for 1-15 years. Buy the right one @ Supreme Motors. We carry ONLY the FINEST! Black on black with EVERY MUST HAVE OPTION, and a clean Carfax from the west coast! THATS VALUE and will ALWAYS be worth more than the questionable rust bucket, car with an accident, or a bland color combination!